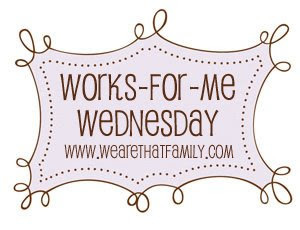 Works for me Wednesday...Ways to make life easier, prettier, healthier, less expensive or more fun. Hosted by We are That Family. As I've mentioned before, we live in a rather small home for the number of us. Our main living area is less than 1800 square feet. We have been working on remodeling our basement for about 2 years now. That gives us another 1500 square feet of family room/laundry room/ game room/play room type area. To make matters worse, our home was built in the 70's, before architects believed in closets or storage. The layout does not allow for more than a bed and bureau in most of the bedrooms. As a matter of fact my boys' bedrooms don't even have enough room for twin beds. When my boys get too tall for their toddler beds, there will be no more putting off our second floor addition. In the meantime, I put a lot of thought into finding ways to store toys, dishes, clothes...you name it...everything from my water bath canner to toilet paper. I have come up with a lot of alternative storage that looks attractive, too. The kitchen was a particular problem. For the size of it...there is no place to put anything. The cabinets were poorly planned out and more than half of the base cabinet space is drawers...good for nothing more than plastic wrap and tea towels. The solution came when my sister moved and gave me her television armoire. I convinced my husband to fit it with shelves and voila...what was a worthless bit of wall in my kitchen became a focal point and a place for boat loads of storage. The top is filled with dishes and the bottom cupboard contains my large collection of cookbooks and recipe boxes with room to spare for cake decorating supplies and the champion juicer. Actually, this idea worked so well, that one day I was driving through town and on the sidewalk was another armoire in excellent condition with a sign that said free. I didn't hesitate a minute before pulling over and asking the owner of the house to load it into the back of my Suburban. It has served us very well for china, crystal and other special occasion pieces that used to be stored in boxes in the attic and laundry room. We have no foyer at all. In our odd shaped and poorly designed living room we have but one small coat closet that doesn't even have enough room for our families coats...never mind company and the other flotsam that collect near the front door of the house. I overcame some of those issues with this little vignette which includes hat boxes, an old filing cabinet (that someone was getting rid of) which fit my decorating style and a vintage suitcase that my daughter got at a Garage sale for fifty cents. Storage issues in the main meeting area of our home took some effort and is still an ongoing process. I started by forgoing a coffee table and getting a deep vintage looking trunk that fit my decorating to serve the purpose. Hidden away inside are piano books, hymnals and instruments. This vintage doctor bag is one of my favorite ideas. When I was putting together my husband's outfit for a costume party, my sister tracked it down on ebay. After the party I didn't know what to do with it. In the last year it has held magazines, stored Bibles and hidden throw blankets until they were needed on cold winter nights. It looks perfect on the floor next to the setee. This little gem of a wine rack makes an excellent place to store rolled up magazines. I added the baskets on top to give it some height and they provide a place for all the books that end up on our coffee table. The trunk I picked up at Joann's a few years ago serves as an accent to our Master Bedroom tropical retreat. I keep it in front of the open door where it looks like just a large door stop. No one would guess it is filled with my exercise clothes. This last little number is my newest idea. Our master bath has no linen closet and no storage to speak of. There is no place to even consider putting any storage. As small as our closets are...they are bigger than our bathroom. I was cleaning out my closet a few weeks ago and came across some of my favorite and fun summer bags. I put two of them underneath my jewelry armoire just outside the bathroom door. Inside went extra lotions, soaps and toilet paper. They looked so cute I added a grass type one to the bureau top and found that deodorant and lotion stood up nicely inside. This is so much fun I could go on all night but I've been neglecting Jillian and the shred so you'll have to fend for yourselves. Don't forget to leave me a comment and share some of your great storage ideas with me. It's my blog's anniversary too! It's been 4 years now. I love all of these great ideas! I especially love the trunk, that is really neat! I really enjoy finding way to mix decorating with storage! You have some great ideas...thank you! Great ideas! What is it they say, "Necessity breeds invention"? You have some wonderfully creative ideas! What fun ideas. It looks very nice. The trunk is one of my favorites and what I need in my living room. We sometimes feel a little over run with music books. Great ideas...we live in a house that seriously lacks storage so I feel your pain :) Thanks for the ideas!! !